He posted this the other day and I'm wondering if we can make something similar in Vuo ;-) I'd love to have images being drawn out in this way. Any ideas? It's awesome M.
Look up Daniel Schiffman / the coding train on youtube. 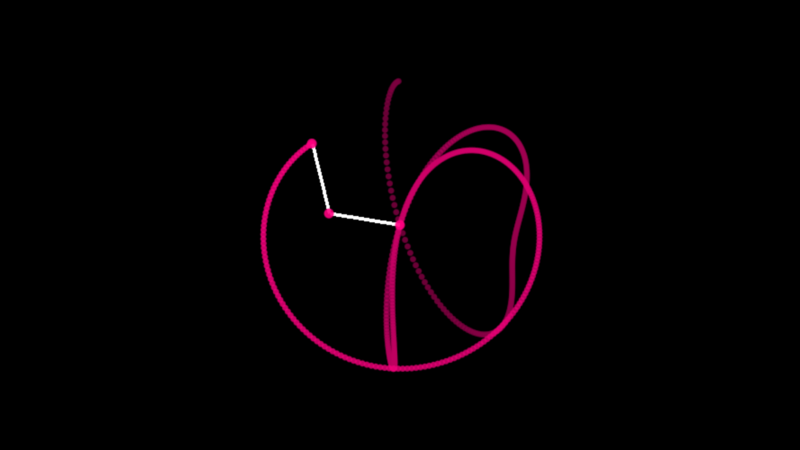 It's not too long ago he did a double pendulum thing in processing. Should be achievable with some math and a couple hold nodes. For those looking I think I found it, https://www.youtube.com/watch?v=uWzPe_S-RVE So I think with a bit of time I'll be able to recreate the double pendulum. Any ideas on the extrude though? I'm thinking using the feedback node, any other suggestions welcome. The pendulum Youtube video looks interesting ! Once the pendulum math is remade it could replace the noise generated animation. That's a very interesting comp Bodysoulspirit. Thanks for sharing ;-) I didn't think to use a line strip mesh like that. Very clever! I didn't think to use a line strip mesh like that. Very clever! Regarding the Double Pendulum man I tried to recreate that but without luck so far. I just don't really understand how to transpose the += sign from the processing code maybe. Or maybe I'm thinking it's too easy and requires deeper calculations. Posting the files here if some math superhero want to help you achieving this :) I guess for a math/coder it should be easy. += means take it's existing value and add what is to the right of the operator to it. Yeah that's how I somehow understood it too when googling it. • take the first value of "a1", put it the 1st port of "the Select Latest node and add this to "a1_v"
I'm working with a similar constraint in my issues of understanding how to loop in Vuo ATM. Check out this simple comp I made to shuffle list values (attached). It includes a debugging method using the Console Window node and others. It allows you to see the events and values inside a loop, something show events or tooltips will not show you. The thread was here: Problem with Process List — I need neighbour values in the list during the iteration. You should be able to get by with just a Hold Value or Hold List node, don't need Select Latest, Changed, Spin Off Event nodes in normal circumstances. The Hold node allows you to do the update on a value using its own contents in the calculation. Typically the update event going to the Hold node (allowing it to update itself) comes from a Build List or Fire Periodically node. This composition is a bit more complex, but it uses position (in polar co-ordinates), velocity and acceleration to move an autonomous car around a track. It just uses Hold Values and calculations to do the maths, most of the other nodes (grey) are additional stuff for screen printing data and converting the polar coordinates to cartesian coordinates. Unfortunately we can't hide them away in macros just yet. Look for the "tangerine" coloured nodes, they do all the work and there's only three holds and three calculate nodes one of each for each variable (position (θ), Velocity and Acceleration). You'll need to relink to this image for the car. Or just substitute with a Vuo circle node. I thought before trying to get a double pendulum I should make the single pendulum (Single Pendulum Daniel Shiffman). Guess I pretty got it, although I don't understand why I have to divide the angle by about 6,5 (because of the gravity values?). And yeah Alastair you were right, a single hold node does the job. PS: Still not been able to make a double pendulum yet, it spins out of control until a NAN value.